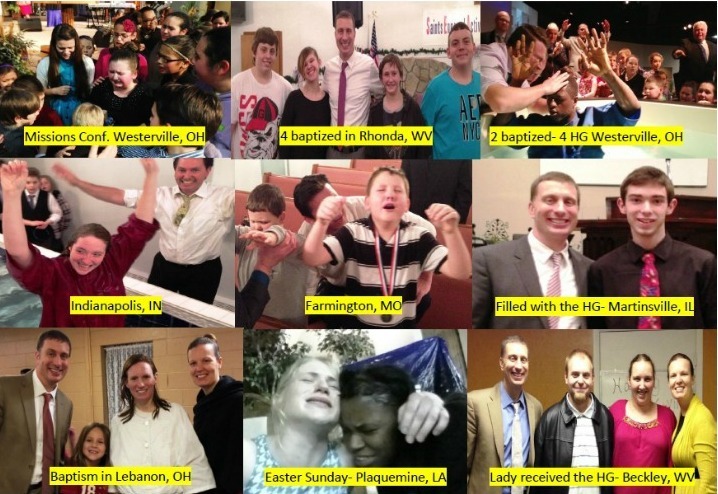 Since the beginning of the year 2013, we have traveled 12,000 miles and ministered in Ohio, Pennsylvania, West Virginia, Kentucky, Indiana, Missouri & Louisiana. We've me some incredible people along the way, making many new friends and having many memorable services that we will not forget. Bobby McWhorter (Meadville, PA) - I had the privilege to baptize an old friend I went to high school with. He was an unbeliever. His girlfriend was sneaky and told him she had a surprise for him and brought him to church to see me and, more importantly, to meet God! Bobby met Him and now is a believer! We give God glory for another soul! Bobby and his girlfriend are attending bible study each Tuesday with an apostolic family that just moved up from Texas into their same neighborhood. The church is 45 min away from where they live. It's not a coincidence this family has moved into the same neighborhood as Bobby & Jeanne live. Pastor Bault has desired to start a daughter work in Erie for quite some time, and God has brought 4 people together to help make this happen! In a torrential downpour, we ministered in Ronda, WV. Because of the rain, twisty & mountainous roads, it was very difficult to see the lines on the road to know where you were at. When we were almost to the church, we noticed a car that was literally slanted on its side off the road, about to go into an overflowing river. We slowed down to check it out and right then the driver's side door swung open and an older lady was straining to get out. I jumped out of the van in the pouring rain and helped her fully open the door and pull her and another lady out of the car. We gave them our golf umbrella and called her son to pick them up. Another man came; he worked at a wrecking company, and said he'd call them to come pull the car out before it slid down into the river. When speaking with these ladies, both said neither of them could swim. So if the car would have gone any farther they both most likely would've drowned. We normally time it to arrive 1/2 hour early before our services. This night we were going to be 1 hour early compensating for the bad weather. There was still plenty of time to set up and minister. We thank the Lord for putting us in the right place at the right time, also for the many in service that were ministered to & 4 individuals who decided to be baptized! The pastor gave us his golf umbrella at the end of service...HA! God does all things well! Our family has been very blessed to be together these past months since we resumed our deputation August 2012. Fanny has a visa extension currently being processed that will help her to remain in the U.S. until the end of June 2013. Because our time is nearing very soon and our plan is to move forward, Fanny & Jaylon are preparing to move to Ireland in June. Jaylon is already registered to begin school there in the fall, and Fanny is currently looking for employment opportunities. We have been blessed to raise 60% of our budget so far during our travels. From the bottom of our hearts, we thank each state missions director, pastor, church & individual that has given in so many ways. We are once again looking at the reality of being apart from one another for 8+ months while I complete deputation travels in the U.S. We ask for your prayers to cover us during our upcoming time apart, and prayers that God would supply all our needs and budget quickly so that we can be with one another and begin our church plan asap! Please contact us at revjoecooney@yahoo.co.uk if God puts it in your heart to give toward our upcoming moving expenses or partner with us monthly with a PIM. In July, during the move to Ireland, we will be attending the Annual Renewal Conference in Vienna, Austria, and will be receiving our Ordination! We are excited that our family will be present for this special time, and that it will be taking place in the presence of our European brothers & sisters. The BALZE Europe & M E program was officially launched Christmas week during Youth Congress-Holland. BLAZE EUROPE is a short term missions opportunity for individuals (Europeans and Middle Easterners only) to travel abroad to another country in Europe, be able to work with nationals in various forms of ministry, and participate in evangelism & reaching the lost for Christ! It's a chance to glean from pastors, revival ministries, and others alike that are searching for the Will of God for their lives. It's a way to experience different people, cultures, and ways of life that one may by no other means be exposed to. Log onto www.eurosoulwinners.com and click on the BLAZE icon, then on "about Blaze" to find out more. Online application and some great fund raising ideas are also available. Check out the rest of the website for many resources to help get you involved in the harvest! Philippines: Another ACTS Bible school year has come to an end (July 6, 2012 ‐ April 5, 2013). Together Deborah and I taught 12‐one hour sessions each week, including night school. What an opportunity to help mold the next generation of ministers! Several groups from America blessed our school this year. Thank you Rev. Mangun and Rev. Terry Shock of the Pentecostals of Alexandria for your generous help in providing scholarship funds to offset the huge expense each student has to carry. Also, thank you for providing roof sealant and manpower to stop the many leaks that have plagued our compound. (Ryan Franklin, Terry Westbrook, Jimmy Savory [POA], Anthony and Hunter Needham [Stephens, Arkansas]). We are also thankful for Rev. George Guy's influence along with Roger Kellum and the TOP church for remodeling our school kitchen and dinning room (stove, water filtering system, tables, chairs, rice cooker, fans, cutting board, etc.). 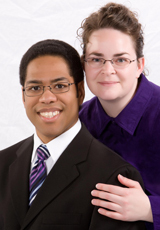 Thank you, Kendra Shock and Trent Gilliam, for serving as AIMer at ACTS. The ministry of Monte and Dianne Showalter blessed this year’s graduation–what a great message! Forty-one students graduated. Vietnamese Students: We were able to bring five young Vietnamese students to Manila this year. They each come from different church backgrounds which has opened up many doors to reach their particular families, pastors and church groups. A new twelve week series of children's lessons entitled "A Mouth Full of Good Things" has been written and printed by the Ghana Missionary Team. We are excited to begin these new lessons leading up to our annual Children's Week the first of May. The key verse "Whoso keepeth his mouth and his tongue keepeth his soul from troubles" (Proverbs 21:23) sums the series up well. Due to the recent visit of the Capital Community Church in Virginia, the United Pentecostal Church International of Ghana has been blessed. Led by Associate Pastor Steve O'Donnell, the fourteen member team networked our national office, painted on our national headquarters compound, taught at our Bible College, preached multiple times, helped put together Sunday school helps and blessed a local orphanage. It was exciting to see ten filled with the Holy Ghost under their ministry. Ministry is always the focus of visiting teams, but it's also fun to share our host culture with guests. CCC was able to walk our rope bridges at Kakum National Park, play with the crocs at Hans Cottage and tour Elmina Castle, the longest standing slave castle in sub-Sahara Africa. Despite the heat, power outages, and yes, even broken down vans, the team persevered with a positive attitude. "Adaptability" is a must with missions! God bless the various mission teams that use their talents for the Lord.